Wide receiver Davone Bess reacts after missing a pass during the second half of the game against the Kansas City Chiefs at Arrowhead Stadium. The Chiefs won 23-17. 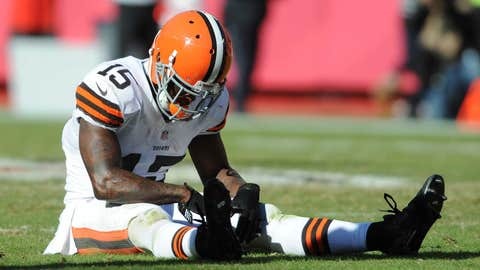 As expected, the Davone Bess era is over with the Browns. The troubled wide receiver was released Wednesday along with wide receiver Brian Tyms and linebacker Paul Hazel. The Browns announced the moves on their Twitter account. Bess missed the final two games on the Reserve/Non-Football illness list. The specifics were never disclosed, but Bess had an altercation at an airport in Florida and had posted various photos on his Twitter account showing him with what appeared to be a banned substance in the days after he was placed on the reserve list. On Feb. 13, ProFootballTalk.com reported that the Browns were in the process of trying to void the $3.067 million in Bess’ salary for 2014. ProFootballTalk.com, citing a league source, reported that the Browns plan to take the position that the guarantee has been voided. Bess was placed on the Reserve/Non-Football Illness list for the final two games of the 2013 season. At the time, Browns general manager Ray Farmer was asked about Bess in his introductory press conference. "The biggest thing is that Davone’s care and his concern is our biggest thing right now," Farmer said. "The dates are inconsequential. Moving forward, we’ll make the decision that we need to make for our franchise, as well as making sure that he’s going to get the care and the things that he needs in the process." The Browns paid Bess’s salary in 2013 after he was placed on the Reserve/NFL list, but he might have lost the guarantees by not playing the final two games. The Browns acquired Bess in a 2013 draft day trade with the Dolphins but he had a very disappointing season with just 42 receptions for just 362 yards and two touchdowns. However, he had 14 dropped passes on the season. Tyms caught just two passes for 12 yards, while Hazel had two tackles on special teams.